I feel like I say "I'm obsessed" a lot - but this time I'm literally psycho obsessed over this line. I have been to their website 72328410390294 times today to "window shop." What is this line and why is it so great you ask?! Let me tell you!! When I was 7 months pregnant I purchased a small roller ball of organic oil perfume at a small boutique in Nashville. I was really crazy about putting anything on my body that wasn't the purest of the pure. I didn't wear any fragrance my entire pregnancy because it was my fist baby and I was scared of everything! 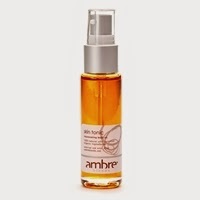 This oil was Ambre Blends in Ambre Essence. It's extremely hard to describe a fragrance in words. This is the most heavenly scent I have ever smelled (I will say heavenly a lot in this post) in my life. It is a smell that you literally cannot pin or put your finger on. I die for any kind of musk and this -to me- is a musk. A very light one though. The smell is almost like the smell of clean skin - yes clean skin and heaven. The company describes this scent the best - "A clean, euphoric, and sensual aroma." Ahhhh....yes those were the words I was looking for!!! I have been wearing this scent ever since I bought that beautiful little roller ball of heaven. The best part of this oil is that as it warms on your skin throughout the day, smelling better as the day goes on. It's kind of hard to smell it on yourself, but throughout the day I get little whiffs of it. Even my baby smells like it by the end of the day. My husband is always saying how good he smells. Uhhh...HELLO it's me?! The baby is taking my scent credit!! I ended up reaching out to this company when I saw on their website that they offer tons of amazing products in my beloved scent. I had no clue?! All this time and I could have been burning candles of my scent all over the house! 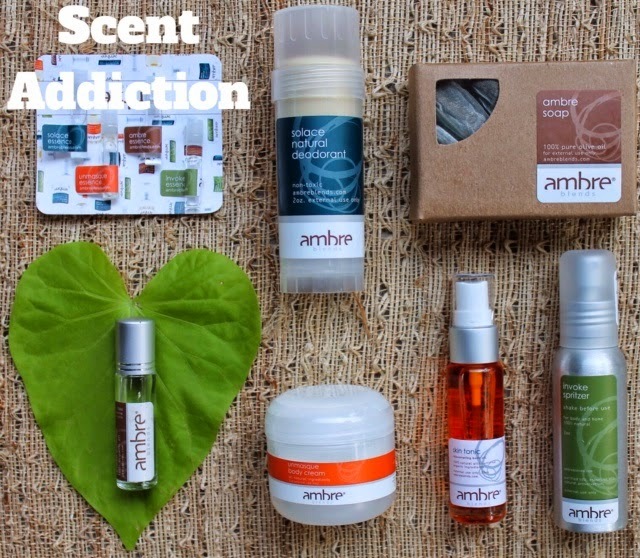 They offer 3 other scents, but they are all based with the Ambre Essence scent - just tweaked a little (I still like the plain Ambre Essence the best). They have lotions, deodorant, face oil, sprays, candles, and soap. I was DYING, I mean DYING to try some of these out. I said this earlier - but incase you forgot - these are all organic products and made from the purest natural oils. Such a plus for me! They sent me the most amazing goodie bag of products to try. The Soap, Skin Tonic, Natural Deodorant, Spritzer, Body Cream, and 4 vials of oil to try. I have been using them for 5 days now. I've used every single product multiple times. I am so thrilled right now I could cry. Every single one of them is my new favorite product. Natural Deodorant - I have used this 5 days in a row now. I only apply it at night (after shower) and not again until the next night. I haven't reapplied during the day once. You know why? I don't have to!! I did a post on Lavanila natural deodorant awhile back and this seriously blows them out of the water. They should probably just pack up and move on - sorry Lavanila. I never got smelly at all. Ever. I have not worked out this week so I can't report on how it works after a workout. I was, however, out in the hot sun and never had any issues. Soap - I just love it because it smells so freaking good!!! This doesn't leave my skin tight because it's made of olive oil. Skin Tonic - I want to do a separate post just on this stuff. This is a face oil and I have the most sensitive skin ever. I break out just thinking about breaking out. I am the oiliest of the oily. I wasn't going to use this on my face because I was just too scared. Today, I had been at the pool and in the sun all day. After my shower, I thought, oh what the hell. I mixed a little pump into my moisturizer. It absorbed right in. My skin felt AMAZING. It's so soft and so moisturized. Not greasy at all. 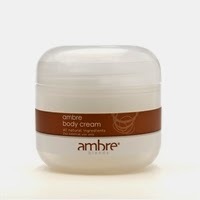 The best part - I keep getting little whiffs of the Ambre Essense on my face. Usually that would freak me out - but I'm so in love with this stuff. It really puts Josie Maran Argon Oil to shame - I never thought I would say that. Body Cream & Spritzer - These are both really nice products, but the spritzer is not in my scent so I haven't been using it as much. The body cream is really moisturizing and a great layering piece. I feel like the days I use the cream my scent is stronger and lasts longer. Visit their website and all of their amazing, organic, skin loving products right here! If you're in the Nashville area you can buy at any Blush Boutique. UPDATE: The Skin Tonic did end up breaking me out a bit. 3 zits to be exact. Dangit!! Stupid oily skin. Oh well. Natural Deodarant: Still working and have smelled perfectly fresh for over a week now. I am amazed!